The labor market continues to recover, but a stubbornly high rate of underemployment persists as more than five million Americans are working part-time for economic reasons (U.S. BLS 2015a; 2015b). Not only are many of this type of underemployed worker, by definition, scheduled for fewer hours, days, or weeks than they prefer to be working, the daily timing of their work schedules can often be irregular or unpredictable. This both constrains consumer spending and complicates the daily work lives of such workers, particularly those navigating through nonwork responsibilities such as caregiving. This variability of work hours contributes to income instability and thus, adversely affects not only household consumption but general macroeconomic performance. The plight of employees with unstable work schedules is demonstrated here with new findings, using General Social Survey (GSS) data. These findings (as well as key findings from other research) are highlighted below. About 10 percent of the workforce is assigned to irregular and on-call work shift times and this figure is likely low.1 Add to this the roughly 7 percent of the employed who work split or rotating shifts and there are about 17 percent of the workforce with unstable work shift schedules. Six percent of hourly workers, 8 percent of salaried workers, and 30 percent of those paid on some other basis work irregular or on-call shifts. Adding in split or rotating shifts, the shares working unstable work schedules are 16 percent (hourly), 12 percent (salaried) and 36 percent (other). By income level, the lowest income workers face the most irregular work schedules. Workers paid under $22,500 per year are more likely to work on irregular schedules than workers in the income bracket above that (workers in the latter bracket who are salaried would be just above the current salary minimum threshold for assured FLSA overtime coverage). Irregular shift work is associated with working longer weekly hours. By occupation type, about 15 percent of sales and related occupations have irregular or on-call schedules. By industry, irregular scheduling is most prevalent in agriculture, personal services, business/repair services, entertainment/recreation, finance/insurance/real estate, retail trade, and transportation communications. Estimates of the proportion of the workforce with “variable hours,” in terms of not being able to specify a “usual” workweek (according to Current Population Survey, not GSS data), are remarkably consistent—almost 10 percent of workers overall. Being part-time more than doubled the likelihood of having hours that vary weekly. The share with variable workweeks also is higher in certain occupations and industries, such as sales, and lower in others, such as professional, managerial, and administrative support. Also, the prevalence is reduced for union members, married workers, government employees, whites, men, and workers with a higher level of education. Nearly half of workers (45 percent) surveyed by the International Social Survey Program said that their “employer decides” their work schedule. Only 15 percent perceived that they were “free to decide” their work schedule. The remaining 40 percent felt they could “decide within limits.” This conforms to another study of “early career” workers; just under half of hourly early career workers surveyed in the National Longitudinal Study of Youth said they have their daily start and end times of work decided entirely by their employer, without their input. Employees who work irregular shift times, in contrast with those with more standard, regular shift times, experience greater work-family conflict, and sometimes experience greater work stress. Less than 11 percent of workers on “regular” work schedules report “often” experiencing work-family conflict in contrast with as many as 26 percent of irregular/on-call shift employees, and 19 percent of rotating/split shift workers. Similar differences appear for reporting that they “never” experience work-family interference. Overtime work that is required by the employer increases the likelihood of having an irregular schedule and particularly of working on rotating/split shifts. 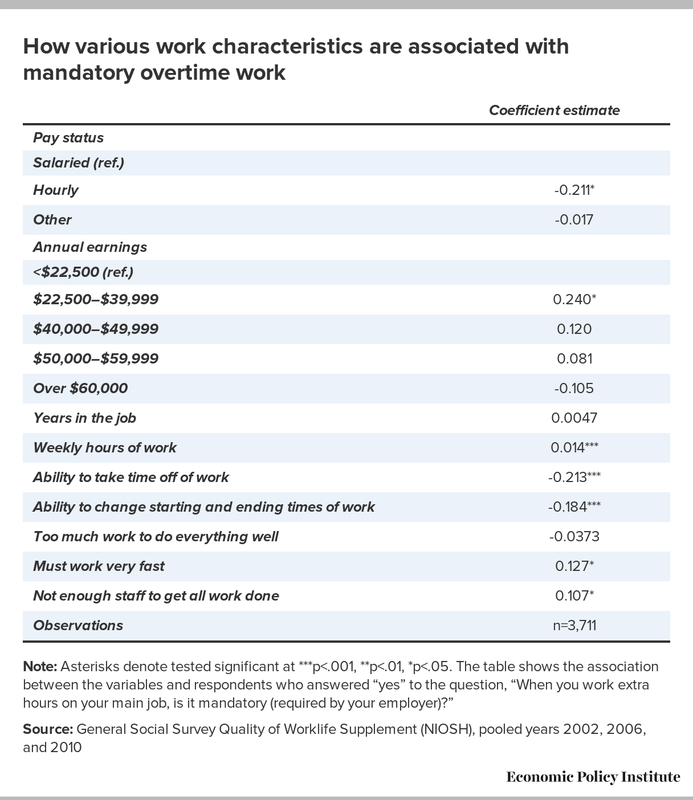 Overtime work that is mandatory is greatest among those who earn at least $22,500 but below $40,000 per year; who work longer weekly hours; who work inflexible daily schedules (they can’t take time off or change their starting and ending times); or who report that there are often too few workers on staff to get all the work done. Work-family conflict is worsened not only by longer weekly hours of work, but also by having irregular shift work. The association between work-family conflict and irregular shift work is particularly strong for salaried workers, even when controlling for their relatively longer work hours. Working on rotating shift times exacerbates work-family conflict, although slightly less than does working irregular/on-call shifts and split-shift arrangements. Irregular/on-call work is moderately associated with higher work stress, but rotating and split-shift times are not. Hourly workers experience greater work stress if working on irregular shift times and more so than salaried workers. 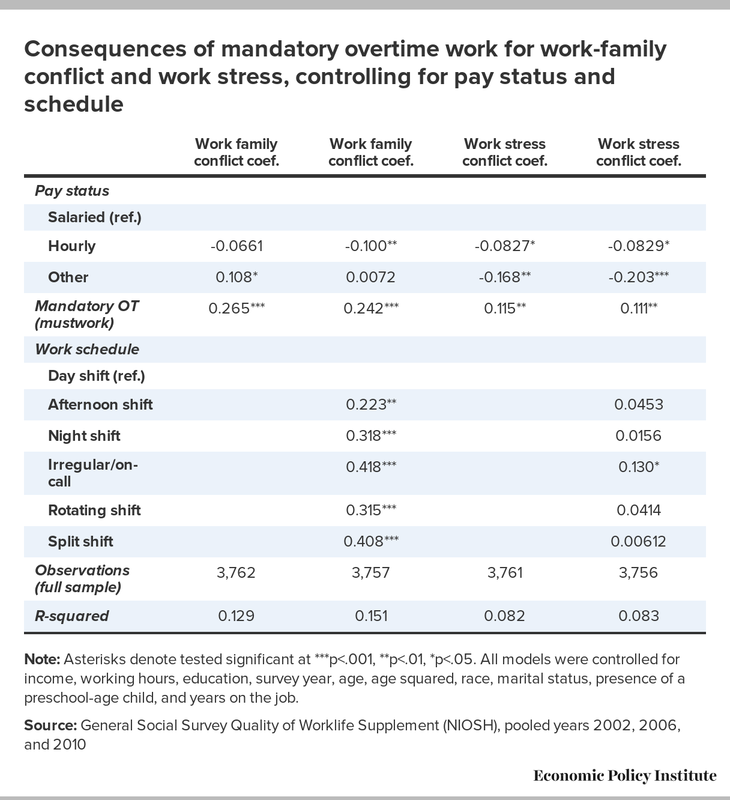 Mandatory overtime work contributes to both work-family conflict and work stress. Being underemployed does not significantly reduce work-family conflict, but part-time workers who prefer that part-time status experience less work-family conflict. On the other hand, being overemployed somewhat exacerbates work-family conflict, no matter what is the level of weekly hours. Because about one in six workers indicate that they are “overemployed” (willing to reduce work time by one day per week and receive 20 percent less pay), better matching of work hours with hours preferences would, on balance, likely reduce the extent and incidence of work-family conflict. With work hours controlled for, having a greater ability to set one’s work schedule (start and end times and take time off from work) is significantly associated with reduced work-family conflict. The documented associations with work-family conflict and work stress not only reinforce the existing “business case” for limiting work hours fluctuation at the behest of employers only, but also underscore the need to adopt preventative public policy measures, such as recent reforms taking place in states and municipalities across the United States. Specifically, community action groups and labor unions that have witnessed the deleterious effects of irregular work schedules on people and their families have spearheaded efforts to propose and adopt legislation at local and federal levels. A legally protected “right to request” changes in work hours, schedules, or location, with protection from retaliation—modeled on the laws in the U.K., Australia, New Zealand, the Netherlands, and Germany—has been implemented in the state of Vermont and in San Francisco and Berkeley, California. These measures provide employees with caregiving responsibilities a right to request flexible work schedules or part-time work. Adopting recommendations from the Retail Workers Bill of Rights, the San Francisco Board of Supervisors has enacted new protections for hourly workers in retail chain stores, to require employers to provide more advance notice in setting and changing work schedules to make them more predictable. The protections include providing priority access to extra hours of work—if and when available—to those employees who explicitly request such hours, which could be a model way to help alleviate the chronic underemployment in the U.S. labor market. San Francisco requires paying workers who have not received sufficient advance notice of last-minute schedule changes for a portion of their hours lost, for “on-call” hours, for being scheduled on split shifts, and for instances in which they are sent home before completing their assigned shifts. Some employers have adopted various voluntary arrangements that might constitute model practices or minimum standards, including some large companies in the highly competitive retail sector. The experiences in cities could inform elements of reforms of the Fair Labor Standards Act (FLSA) at the national level, such as the proposed The Schedules that Work Act (H.R. 5159). Facilitated by new software technology, many employers are adopting a human resource strategy of hiring a cadre of part-time employees whose work schedules are modified, often on short notice, to match the employer’s staffing with customer demand at the moment (Lambert, Haley-Lock, and Henly 2012). Such jobs are disproportionately found in the service occupations and in the retail and wholesale trade and services industries, such as hospitality and leisure, professional and business services, and health services.4 The costs of underemployment to the economy can be substantial.5 Moreover, because precarious employment is concentrated among relatively lower-income earners, it not only exacerbates growing income inequality (Standing 2011), stifling potential economic expansion and underutilizing potential available labor input, but takes a toll on the well-being of working families. One key source of underemployment is that at least periodically, employees are scheduled for fewer hours than they prefer to be working, in days or weeks that are not necessarily regular or predictable. Thus, the consequent experience of involuntary part-time employment not only constrains the incomes of those workers, but often makes the daily work lives of those individuals unpredictable and more stressful. It has the indirect effect of restraining or making unpredictable the income that would fuel consumption spending on which the economy depends, and directly affects workers’ daily lives, by complicating the navigation of nonwork responsibilities such as parenting, other forms of caregiving, and schooling.6 At the same time, however, there is a significant segment of the workforce that may have the number of hours they prefer but the timing of their work schedules—including through irregular shifts, unwelcome overtime work, and lack of schedule control—makes daily work-life navigation difficult. Interestingly, there is also a nontrivial proportion of workers who actually would prefer to work fewer hours even if it means proportionally less income. This report will inform recently proposed reforms of the Fair Labor Standards Act (FLSA) with evidence from recent surveys regarding which workers report being underemployed and which jobs tend to exhibit such irregular work schedules, including on-call schedules, split shifts, rotating shifts, and required overtime work. It then presents evidence regarding the adverse effects on workers who work such irregular and on-call work schedules, in contrast to those with more regular shift times. The outcomes of interest are work-family conflict and work stress. It will also present evidence of the beneficial effects on work-family integration and work stress when employees report having input into the scheduling of their work and/or flexible work schedules. This will reinforce the existing “business case” for employers to provide more predictable, stable work schedules for employees for firm performance.7 Based on research reviewed here that worker earnings insecurity has risen and is detrimental to macroeconomic stability, it provides support for adopting policy measures that would temper fluctuations in the daily and weekly work hours of hourly paid employees. Finally, it will close by surveying various voluntary arrangements that might constitute model practices or minimum standards including advance notice for setting and changing work schedules; payment for reporting time and split-shifting if not in line with a minimum advance-notice time; and in special cases, a preference for adding work hours for those employees who explicitly request such hours, reducing the incidence and extent of underemployment (and in the process, perhaps the incidence and extent of overemployment) among other workers. This section summarizes evidence from the literature regarding which workers report being underemployed and which workers tend to experience fluctuating work schedules and their economic impacts. Much of the attention on underemployed workers has focused on data from the monthly Current Population Survey (CPS) of household employment, which computes the monthly number of “involuntary part-time” workers. Such workers have less income than other workers (Glauber 2013). The median income for families in which women were working part-time for involuntary reasons ($36,000) was far lower than that for women working part-time voluntarily ($68,000)—fewer of the former are married—and the size of the relative disparity is similar among men. Regarding the voluntariness of part-time work, Pew Research periodically tracks people’s preferences for part-time work, in contrast to alternatives. It asks respondents, “Considering everything, what would be the ideal situation for you — working full-time, working part-time, or not working at all outside the home?” Among women with at least one child under the age of 18, part-time has consistently been the top preference. Among mothers who currently work full-time, many (44 percent) would rather be working part-time. However, interestingly, an almost equally high proportion of mothers who are not at all employed currently would prefer to be working part-time (plus another 22 percent who regard working full-time as ideal). This suggests a kind of hidden underemployment, in addition to those who work part-time but desire full-time workweeks. Also, interestingly, the share of mothers preferring full-time work increased sharply between 2007 and 2012 (from 20 percent to 32 percent). This likely reflects a response to the Great Recession and consequent stagnation in household income.11 Most pertinent, mothers in the bottom half of the income scale are far more likely than more affluent mothers to prefer working full-time—40 percent of mothers with annual family incomes of less than $50,000 said full-time work would be ideal, compared with 25 percent of mothers with incomes of $50,000 or higher (Wang 2013). A recent poll of 1,000 U.S. adults by the Huffington Post and YouGov poll documents the extent and incidence of underemployment, by considering a broader scope than just working part-time hours or not working at all. It asked, “If you had the opportunity to work one more day per week, and receive 20 percent more pay, would you take that opportunity?” (Delaney and Swanson 2014). Over half the sample, 52 percent, would (see Appendix Table A-1 at the end of this report).13 There were no real gender differences in this regard. By age, the rate was almost 60 percent in the 18 to 29 age bracket, then progressively lower by age, but still at a high 48 percent among those age 45 to 64 (then rising again among those 65+). By family income level, not surprisingly, the underemployment rate is higher among those reporting less than $40,000 per year (57 percent). The rate becomes progressively lower up to $100,000, but still remains at 43 percent among those families with incomes over $100,000 per year. By race, a preference for more work hours and proportionately more pay is more prevalent among blacks (60 percent) and Hispanics (74 percent), though it is still a high 47 percent among whites. Most pertinently, by employment status—it is 60 percent among part-time workers. Nevertheless, the rate is still a high 50 percent among full-time workers. Interestingly, not unlike the Pew poll, half of those outside the work force—retirees and homemakers, would prefer to work at least one more day per week, and among students, this was 65 percent. The persistence of all these various forms of underemployment is at least partly responsible for the inability to achieve full economic recovery and expansion. Household earnings are constrained not only by stagnant wage rates,14 and the lack of any (let alone premium) pay for extra hours of work,15 but by workers not able to find or get additional, preferred hours of work. While a notably and surprisingly high percentage of the workforce maintains a desire for more income even if it means proportionately more work hours, nearly one in five workers are “overemployed”—15 percent (down from 18 percent last year) say they would take the opportunity to reduce work time by one day per week and receive 20 percent less pay (see Appendix Table A-2 at the end of this report).16 This suggests that the labor market still not only suffers from a lack of work but also from a substantial maldistribution of work. While underemployment cannot be simply eradicated by shifting work from the overemployed to the underemployed, because much of such work is not directly transferable between employees, it is possible that at least some could be shifted, to the benefit of both groups. For example, low-level supervisors and managers, whose extra work hours are not usually covered by overtime pay rules (if their salary exceeds $23,660 per year), often perform nonmanagerial tasks as part of their job and frequently work longer than 40 hours a week (without any extra pay required for those additional hours) (See Golden 2014; Lambert, Fugiel, and Henly 2014; Lambert, Haley-Lock and Henly 2012). Work schedules or shifts that are irregular are consistently found to be associated with assorted adverse outcomes for workers (Askenazy 2004; Costa, Sartori, Akerstedt 2006; Heisz and LaRochelle-Cote 2006; Camerino et al., 2010;Tucker and Folkard 2012; Olsen and Dahl 2010; Haley-Lock and Ewert 2011). One such study examined the extent to which work demands, including irregular work schedules, are related to work-family conflict as well as life and job satisfaction among nurses. Irregular work schedules (along with work overload) are the predictors of work-family conflict, and that work-family conflict is in turn associated with lower job and life satisfaction (Yildirim and Aycan 2008). Generally, having to be constantly available for work, not just long hours per se, creates a daily struggle for workers to reconcile competing caregiving and workplace demands (Correll et al. 2014). The fact that household income has become more volatile in the most recent four decades, through the late 2000s, is a key labor market development. It is also surprising, given the relatively higher stability in the macroeconomy until 2007. The higher volatility is attributable mainly to men’s volatile earnings pattern (which presumably does not reflect preferences for greater variability), which in turn reflects in no small part instability in their hours worked (Dynan, Elmendorf, and Sichel 2012).18 A close examination of two (of the three main, reliable) national panel data sets confirms that in the 2000s, men’s earnings volatility has risen (Shin 2012; Ziliak, Hardy, and Bollinger 2011; Dahl, DeLeire, and Schwabish 2011; Gottschalk and Moffitt 2009).19 Most recently, a one-time survey in 2013, which focused on low- and moderate-income families (Federal Reserve Board 2014) suggests a clear upward trend in income volatility, worsening during the 2009–2013 recovery period. A surprisingly high share (over 30 percent) of Americans report experiencing significant spikes and dips in their incomes. Most important here, among such workers, 42 percent attribute the variability to an irregular work schedule (while an additional 27 percent cite seasonality of work or an unemployment spell, and the rest being paid by bonuses or commissions). This reason for income volatility, an (irregular work schedule), constitutes almost as much as all other work reasons put together. Of the 42 percent whose work hours change from week to week, 58 percent work full-time, 30 percent work part-time, and 11 percent are self-employed. Moreover, 10 percent say that their income varies substantially from month to month while another 21 percent say that they occasionally experience a work month with unusually high or low incomes.20 Another study, of 235 household time diaries, found that nearly all such sampled households experience a drop in monthly income of at least 25 percent during the course of a single year. Reduced work hours are one of three main culprits (along with health problems and unexpected increase in household member size). Tellingly, over 3 in 4 workers stated a preference simply for financial stability, over “moving up” (Murdoch and Schneider 2014). Work hour schedules are not uncommonly posted no more than a week in advance for employees, sometimes even less, for work the following week. A common consequence is that such practices limit employees’ opportunity to balance work, social, and family responsibilities (Zeytinoglu et al. 2004; McNamara, Bohle, and Quinlan 2011). Among workers without indefinite employment contracts (“casual workers”), workers reporting more variable working hours were more dissatisfied with their hours (in Australia, Bohle et al. 2011). Employees’ dissatisfaction with their work hours, not too surprisingly, is intensified by the interaction of want of schedule control and the variability of their hours. To wit, a recent, comprehensive examination of National Longitudinal Study of Youth (NLSY)panel data (of relatively younger workers) uncovers which specific workers’ characteristics, industry and occupation, are associated with the most advance notice of schedule, schedule control, and fluctuations in weekly hours (Lambert, Fugiel, and Henly 2014). Little advance notice of posting of work schedules, daily scheduling changes, and overtime work can lead to increased work-family time conflict, but also to work stress, child care difficulties, and variable earnings (e.g., Shin and Solon 2011). How far in advance do employees know what days and hours they will need to work? Almost 4 in 10 now (38 percent) of such “early career” employees know their work schedule one week or less in advance. Having such short notice is more common among workers paid by the hour (41 percent) than by other means (33 percent) and also among part-time (48 percent) workers, but not uncommon among full-time workers (35 percent). While 41 percent of hourly workers report knowing their work schedule only one week or less in advance, an almost identical proportion (39 percent) report knowing their work schedule four or more weeks in advance. Thus, many employers are certainly capable of informing hourly employees well in advance. In addition, 29 percent of nonhourly workers (20 percent of nonhourly women; 38 percent of nonhourly men) said they “know when they will need to work” one week or less in advance. Workers’ hours varied on average by 47 percent. Advance notice of schedules is distributed quite differently among occupational groups. Among service workers, production workers, and skilled trades, most employees know their schedule only one week or less in advance. Service and production supervisors, however, are among both those with the shortest and the longest advance notice categories. In contrast, the majority of professionals, business staff, and providers of social services (for example, school teachers, social workers, and nurses) know their work schedule four or more weeks in advance. Furthermore, approximately 74 percent of employees in both hourly and nonhourly jobs experience at least some fluctuation in weekly hours over the course of a month. Among workers with children, 40 percent report one week or less advance notice and 50 percent say they have no input into their schedule. Employers determine the work schedules of about half of young adults without employee input, which results in part-time schedules that fluctuate between 17 and 28 hours per week. For the majority of employees who work fewer than 40, as well as those with more than 44 hours in a normal week, hour fluctuation is the norm. So, among workers with the longest hours, the 40-hour workweek seems not to be the norm but rather, just a lower bound. The mean variation in the length of the workweek is 10 hours among hourly workers as compared with nearly 12 hours among nonhourly workers. Among the 74 percent of hourly workers who report having fluctuations in the last month, hours vary by a whopping 50 percent of their usual work hours, on average. A sampling (nonrepresentative) of retail sector workers in and around New York City finds that only 40 percent of such employees have a minimum number of hours set per week (Luce, Hammad, and Sipe 2014). Moreover, a quarter of them work “on-call” shifts, with most not finding out if they are needed at work until two hours before the start of the shift. For workers with significant care-giving or financial commitments, having weeks with as few as zero hours and days when there may be either no work or short notice to arrive at work, may make balancing work with life stressful, intolerable, or even impossible, forcing them to choose between participating in the paid labor force, unemployment, or withdrawal from the labor force. In the QWL, a key question is asked of the employed, “Which of the following best describes your usual work schedule?” Respondents may check one of the following: day shift, afternoon shift, night shift, split shift, irregular shift/on-call, or rotating shifts. Table 1 shows that about 10 percent of the employed work on shift times that are irregular, including those that work on an on-call basis. Adding in those who work on other types of shifts that are not fixed—rotating shifts or split-shift times—the proportion rises to about 17 percent of the employed. More specifically, those who work irregular or on-call shift times are about 6 percent of hourly workers, 8 percent of salaried workers, and 30 percent of those paid on some other basis (such as contract work). Note: Asterisks denote tested significant at ***p<.001, **p<.01, *p<.05. "Regular" shift includes day, afternoon, and night shifts. Chi-square was conducted to test group differences across categorical variables; ANOVA was conducted to examine group differences across continuous variables (work-family conflict and work stress). 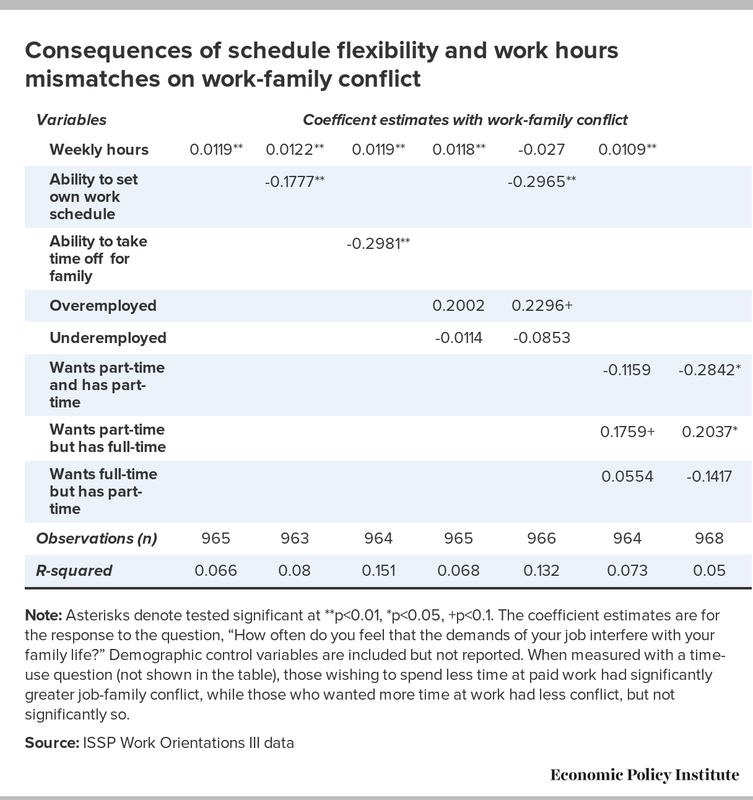 Based on post-hoc ANOVA test, work-family conflict is more frequent for both those on irregular and split-rotating shifts, while workers on regular schedules have shorter hours than those on split-rotating shifts and less work-family conflict than both those on irregular and split-rotating schedules. The GSS occupational classification is OCC80 and the industry classification is IND80. Respondent income is in inflation-adjusted constant (year 2000) dollars. Table 1 also shows that lowest-income workers have the most irregular work schedules. Those with incomes below the low salary of $22,500 (just below the current salary minimum threshold for assured FLSA overtime coverage) have a slightly higher-than-average proportion working irregular shifts (11 percent versus 10 percent). In addition, those working irregular shifts or variable hours (rotating or split shifts) work a relatively longer workweek, on average. There is, however, variation by occupation. In particular, about 15 percent of workers in sales and related occupations have irregular schedules, while most other occupations are quite near (or in the case of administrative support) far below the national average. By industry sector, irregular scheduling is high relative to the average in the following industries: retail trade (12 percent), finance/insurance/real estate (12 percent), business/repair services (15 percent), personal services (17 percent), entertainment/recreation (15 percent) and unsurprisingly, agriculture (19 percent). 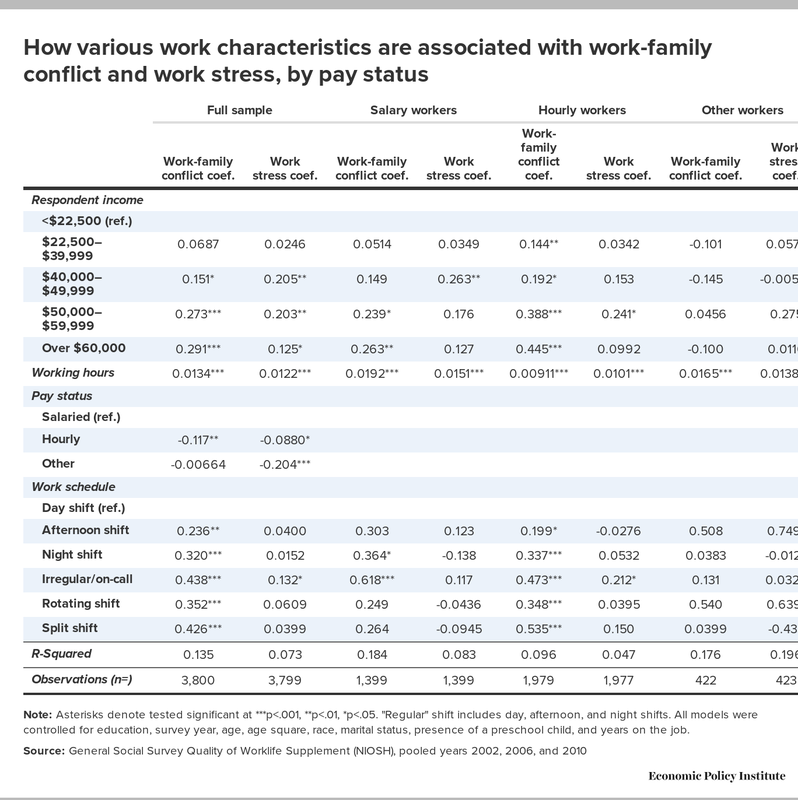 Finally, variable work shifts, in particular, irregular and on-call work, appear to be associated with significantly higher reported frequency of having work-family conflict (as shown in the bottom section of Table 1). It is also associated with greater reported work stress, although this difference is not statistically significant. Specifically, available in the underlying data but not shown in the table, 28 percent of those on “regular” schedules report “never” experiencing work-family conflict, in contrast to only 24 percent of those on split/rotating shifts and 20 percent on irregular/on-call shifts. Similarly, the share reporting “often” experiencing such work-family conflict was 26 percent among irregular/on-call shift employees, and 19 percent among rotating/split-shift workers, whereas less than 11 percent of those on more regular work schedules report work-family conflict. What determines whether a worker tends to have an irregular shift? Ordinary Least Squares and probit regressions are conducted to identify the individual work and personal characteristics that are associated, positively or negatively, with the dependent variable “irregular” shift time (also rotating and split-shift times). Both working an irregular/on-call shift or split/rotating shift are inversely associated with age, but also turns upward at older ages—particularly the split or rotating shift work schedules. Thus, the pattern of distribution of irregular schedules is slightly skewed toward younger workers, but not decidedly so. Years on the job have no effect either way, which may be somewhat surprising. By race, irregular work schedules appear to be greater among whites than non-whites, but this phenomenon is almost entirely attributable to racial differences in income, work hours, and access to flexible work scheduling arrangements. Being married has no relationship to working irregular/on-call shifts, but is associated positively with working more split or rotating shifts. However, this is entirely due to married workers’ levels of income and work hours. Perhaps surprisingly, having young children has no influence either way. Being male actually strongly increases being on an irregular shift (gender has no association with working split or rotating shifts). 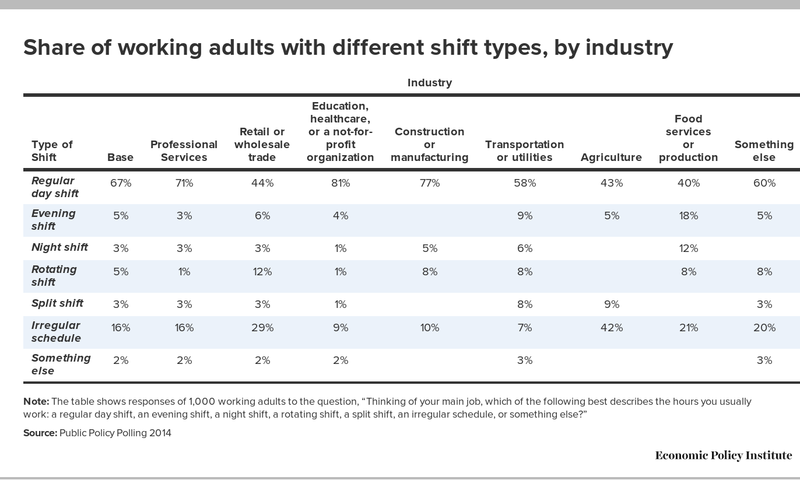 Education level has little bearing on incidence of working either type of shift, with the exception that having “some college” puts workers more in the split or rotating shift status. Note: Asterisks denote tested significant at ***p<.001, **p<.01, *p<.05. Those who are not on split/rotating or irregular shifts are on regular shifts (day, afternoon, or night). All models were controlled for education, survey year, age, age square, race, marital status, presence of a preschool-age child, and years on the job. Does working unusual or unpredictable shift times exacerbate the experience of work interfering with family time, controlling for the number of work hours, income, pay status, and other job or worker characteristics? Does it also affect the degree of reported work stress? Does mandatory overtime work contribute to these outcomes (work-family conflict and work stress)? Table 4 shows the results of multinomial probit regression estimations on these two dependent variables.37 It focuses on the contrast between working on the usual daytime (actually, afternoon) shift time with afternoon, night, irregular/on-call, rotating, and split-shift scheduling. Table 4 then shows the results when distinguishing between workers who are paid by salary, by the hour, and by other type of employment arrangements. Overall, the results are most clear for irregular/on-call work, relative to regular daytime shifts. In the entire sample, irregular shift work is strongly associated with significantly greater work-family conflict, for the three years of data pooled. Indeed, the size of the coefficient estimates suggests that shift working that is irregular has the strongest adverse effect on work-family harmony. This is particularly evident for salaried workers. It is adversely associated for hourly workers as well, and is exceeded only by having split-shift work as an association with work-family conflict among hourly workers.38 Notably, this effect of irregular shift work on work-family conflict exists even when controlling for relatively longer average work hours. (Weekly hours, unsurprisingly, is associated with greater work-family conflict and work stress).39 Working on rotating and split-shift times (for all workers and hourly workers) is also associated with work-family conflict, albeit more moderately than irregular/on-call shift working. The same holds true for night shift workers (except those categorized as other.) Finally, while hourly workers report less frequent work-family conflict than salaried, on average, all types of shift times other than the traditional day shift exacerbate their work-family conflict. For salaried workers, in contrast, it is just irregular/on-call shift work (and to a smaller degree, night shift working) that exacerbates work-family conflict. Note: Asterisks denote tested significant at ***p<.001, **p<.01, *p<.05. "Regular" shift includes day, afternoon, and night shifts. All models were controlled for education, survey year, age, age square, race, marital status, presence of a preschool child, and years on the job. Table 5 illustrates how having overtime work that is mandatory, which is arguably one form of work being irregular, contributes to the experience of work-family conflict and work stress.42 It finds unequivocal evidence that having mandatory overtime work is associated with more frequent work-family conflict.43 Indeed, it is also clear that having mandatory overtime work conditions reduces work-family balance independent of shift times being irregular. Similarly, although by about half the magnitude, mandatory overtime is associated with greater work stress, all else constant.44 Again, this adverse effect is unaffected by controlling for workers’ shift times. Thus, workers with mandatory overtime work experience both greater work-family conflict and work stress, and their well-being might benefit from a greater ability to work overtime more on a voluntary than required basis. Note: Asterisks denote tested significant at ***p<.001, **p<.01, *p<.05. All models were controlled for income, working hours, education, survey year, age, age squared, race, marital status, presence of a preschool-age child, and years on the job. Note: Asterisks denote tested significant at **p<0.01, *p<0.05, +p<0.1. The coefficient estimates are for the response to the question, “How often do you feel that the demands of your job interfere with your family life?” Demographic control variables are included but not reported. When measured with a time-use question (not shown in the table), those wishing to spend less time at paid work had significantly greater job-family conflict, while those who wanted more time at work had less conflict, but not significantly so. Note: Asterisks denote tested significant at **p<0.01, *p<0.05, +p<0.1. The coefficient estimates are for the response to the question, “How often do you find your work stressful?” Demographic control variables are included but not reported. Which workers have variable workweeks? In the monthly CPS, workers are asked to report their “usual hours.” If they cannot specify, they are categorized as “hours vary.” Using the Work Schedule Supplement (May 1997, also administered in 2001 and 2004, but ceased) (n=2,887), about 9 percent of the work force were classified as having hours that vary. However, variable hours were found to be more prevalent in certain occupations and industries, and for certain worker characteristics. An individual had a reduced probability of not being able to specify their workweek if he fit in one or more of the following categories: a union member, a government employee (all levels, but particularly local public sector), has higher education, is white, is male, and is married. Certain occupational classifications also were associated with reduced variability of work hours—professional, managerial, and administrative support. On the other hand, certain occupations increased weekly hours variation: sales and related occupations and sales representatives, services other than protective (especially private household service and health service occupations), precision production, craft and repair (especially fabricators), transportation and material moving, and farming. Some other detailed occupational classifications faced variable hours: management-related occupations, lawyers and judges, health technicians, engineers, construction trades, and finance/ business service occupations. Variable hours were also above the sample average in the following industries, starting with the highest: agriculture, private household services, tobacco manufacturing, auto/repair, construction, personal services, entertainment/recreation, transportation, other professional services, eating/drinking establishments, and toys/sporting goods manufacturing. Some of the workweek-stabilizing effect of unionism is traceable either to employment in government or the detailed industry distribution of union jobs. Half the higher probability of having unstable workweeks for nonwhites, and virtually all of the higher probability for women, is attributable to the distribution of their jobs across industries, thus, attributable largely to industry segregation in employment. Those in craft jobs also have reduced chances of working variable hours, but this is due to the concentration of such jobs in certain industries. The greater variability of hours for sales workers was to a large extent attributable to the more flexible scheduling associated with this major occupational classification. Indeed, generally, workers have a far greater likelihood of having a variable length of the workweek if they have both shorter than standard hours and access to flexible daily starting and ending times. The most salient finding was that having variable hours is strongly positively associated with usually working part-time, as opposed to working full-time. Being part-time more than doubled the likelihood of having hours that vary weekly. Usually working full-time reduced the chances of having an unpredictable workweek by more than 40 percent. This suggests part-time hours are used to buffer stability for full-timers. A small but nontrivial proportion of the U.S. workforce usually works part-time, but actually works beyond the typical demarcation point of 35 hours (using the May 1997 CPS Supplement on Work Schedules). About 4 percent of the usual part-time workforce (1.4 percent of the total employed) usually work part-time, but in the survey week worked 35 hours or more. Unfortunately, part-timers are not asked the reasons why they are working full-time hours. Presumably, much of this extra work may be involuntary, thus “overemployment.” The number in the category may actually be greater, however, since the share of part-time workers reporting that their usual hours vary is 11 percent, and of this share many workers may exceed 34 hours. Probit analysis suggests that the likelihood of being usually part-time but actually working 35 or more hours is enhanced by being white, female, not married, enrolled as a college student, not in a union, having a four-year college degree, and being employed in one of the following occupations: handlers/laborers, machine operators, private household work, sales, services and protective services, and not self-employed. Policy efforts to curb such hours of overemployment, such as a right to refuse extra work hours without retaliation, might go some way toward reducing underemployment of other part-time employees, were they in the same establishment. Given the evidence presented here and in other, recent studies of the relationship between long, irregular or unpredictable work hours and work-family conflict, which policies might prove effective at mitigating the conflict? Other countries have taken steps to limit the unpredictability of work schedules and promote a legally protected ability of workers to adjust their work schedules?48 Regarding the latter, an important first step has been proposed in the U.S. Congress, and one state and a handful of cities have passed or are considering a protected employee “right to request.” Such a right to request is intended to protect from punishment those who choose to limit their work hours in order to address family duties, to promote continuance of working at one’s current job, and to accommodate the choice of parenthood even if labor force withdrawal is affordable (Kulow 2012). The evidence presented suggests that providing that “right” at least on an individual, case-by-case basis would be helpful in part because access to more flexible working arrangements is so disparate by sector. While access is particularly limited for hourly workers (Sweet et al. 2014; Golden 2009; Lyness et al. 2012; McNamara, Bohle, and Quinlan 2011; Williams and Boushey 2010), salaried workers, perhaps especially those in lower level supervisory positions, might benefit at least as much because they are even more likely to be on irregular work schedules. In 2014, the San Francisco Board of Supervisors approved new protections for the city’s retail workers, which took effect on January 5, 2015. The measures are intended to give hourly retail staffers more predictable schedules and priority access to extra hours of work available. The legislation applies to retail chains with 20 or more locations nationally or worldwide and that have at least 20 employees in San Francisco under one management system (thus affecting about 5 percent of the city’s workforce). The ordinances require businesses to post workers’ schedules at least two weeks in advance. Workers will receive compensation for last-minute schedule changes, “on-call” hours, and instances in which they are sent home before completing their assigned shifts. More specifically, workers will receive one hour of pay at their regular rate of pay for schedule changes made with less than a week’s notice and two to four hours of pay for schedule changes made with less than 24 hours’ notice. Moreover, it requires “formula” retail employers (chain businesses subject to the rule) to provide two to four hours of pay to an employee at his regular rate of pay when he is required to be “on-call” for a specified shift but the employer cancels the shift with less than 24 hours’ notice. Finally, it prohibits formula retail employers from discriminating against employees with respect to their rate of pay, access to employer-provided paid and unpaid time off, or access to promotion opportunities. This will more forcefully protect employees on part-time status, for example, by providing part-timers and full-timers equal access to scheduling and time-off requests. The Retail Workers Bill of Rights which was substantially incorporated into the San Francisco ordinance to protect workers in the city’s formula retail chain stores and restaurants (Jobs With Justice San Francisco n.d.) 50 It contained a novel provision to promote what it termed, Full-Time Work and Access to Hours. If a formula retailer had additional hours of work to offer in job positions held by current part-time workers, it would be required to offer those hours of work first to existing (qualified) part-time employees before hiring additional part-time employees or before hiring through a temporary services agency, staffing agency, or any similar contractor. SeaTac, Washington, also passed a similar provision as part of “Prop 1.” It requires employers covered by the law to offer additional hours or to “promote” part-time workers to full-time work before hiring additional part-timers from outside (Ballotpedia 2013). (It is not yet implemented because a judge blocked enforcement at Seattle-Tacoma International Airport, pending appeal.) Such new legal protections were spearheaded by the efforts of both the “Just Hours” campaign of the Retail Action Project (RAP) and the “Fair Workweek Initiative” of the Center for Popular Democracy (CPD). Such ground level efforts are aimed specifically at addressing the very work scheduling practices that have led to chronic underemployment of so many workers. The Berkeley Flexible Work Time Initiative was passed overwhelmingly by voters in the November 2014 election. This measure advised the Berkeley, California, City Council to adopt an ordinance that would allow both private- and public-sector workers to request part-time work, and to ask the state and federal governments to draft legislation to give employees a right to shorter or more flexible work hours unless a legitimate business reason for denial of the request was presented in writing. Eight U.S. states (plus the District of Columbia and Puerto Rico) have legislated various reporting pay laws and policies. These laws and policies, which are sometimes called “show up pay,” compensate employees for a minimum number of hours during a work shift for which they have been scheduled, even when the employee is sent home because the employer has no work for him or her to perform. While employees may still be sent home from work, they are guaranteed one or more hours of pay to offset the expenses associated with showing up at work (transportation, childcare, etc.). In California, for non-exempt employees in the mercantile, public housekeeping, and amusement/recreation industries, if an employee reports to work when required, but is given less than half of the usual/scheduled day’s work, the employee must be paid (at her regular rate of pay) for half of the usual/scheduled day’s work, but not less than two hours. In Connecticut, a non-exempt employee in the mercantile trade and restaurant industries who reports for duty (by request or permission of the employer) must be paid a minimum of four hours of pay at her regular rate (only two hours for restaurant and hotel workers). Non-exempt employees in the District of Columbia must be paid for at least four hours, payment at the employee’s regular rate for the hours worked, plus payment at minimum wage for the hours not worked. In Massachusetts, non-exempt employees (except those in charitable organizations), who are both scheduled to work at least three hours and report on time must be paid for at least three hours at no less than the minimum wage even if no work is available. In New Hampshire, non-exempt employees (except those working for counties or municipalities), must be paid not less than two hours’ pay at the regular rate of pay if an employee reports to work at the employer’s request (unless the employer makes a good faith effort to notify an employee in advance not to report to work). In New Jersey, if a non-exempt employee reports to work at the employer’s request, she must be paid for at least one hour at the applicable wage rate. Non-exempt employees in the restaurant and hotel industries in New York who (by request or permission) report for duty must be paid at least three hours for one shift or the number of hours in the regularly scheduled shift, whichever is less. Other specific minimum payments are required when workers were scheduled to work two or three shifts. In other “miscellaneous industries and occupations,” an employee is entitled to a minimum of four hours of pay, or the number of hours in the regularly scheduled shift, whichever is less. In Oregon, an employee younger than 18 years old who is required to report for work must be provided sufficient work to earn at least one-half of the amount earned during the minor’s regularly scheduled shift. In Rhode Island, an employer who requests or permits a non-exempt employee to report for duty at the beginning of a shift must either provide three hours of work or three hours of pay to that employee (Alexander, Haley-Lock, and Ruan 2014; CLASP 2014; Center for Law and Social Policy, Retail Action Project, and Women Employed 2014; Starosciak 2013). Canada has legislated reporting pay requirements in its federal sector and in several of its provinces. The amount of pay owed differs among jurisdictions. In British Columbia (BC) and the Yukon territory, employees must be paid two hours at regular wage, and in BC, four hours must be paid at the regular rate if the shift was scheduled to be over eight hours, and two hours at the regular rate if the shift was not scheduled to be that long or if the reason the employee cannot work is outside of the employer’s control. In Ontario, Saskatchewan, New Brunswick, Nova Scotia, Newfoundland and Labrador, and Alberta, compensation is mandated for a minimum of three hours at the minimum wage. In Quebec, Prince Edward Island, and Manitoba, compensation is mandatory at a minimum of three hours at the employee’s regular wage. In the Northwest Territories and Nunavut, employees are owed four hours at the regular wage if they show up to work their shift and less than four hours of work is provided. The federal sector requires three hours at the regular wage. Finally, employees have the right to refuse overtime without repercussions in Saskatchewan, Québec, and Yukon. Wider adoption of such reporting pay requirements might help to compensate employees in ways the labor market is currently not necessarily compensating them for the work-family conflict and stress they experience when regular or overtime work is unpredictable in a given day or week (Canadian Labour Congress 2011). In the U.K., the legal right to request for those with caregiving responsibilities was extended (in July 2014), now allowing all employees (not just caregivers) to request flexible work arrangements, if they have been with a company for at least half a year. An employer can still deny a request if it has a good business reason for doing so. There is now a more formally established appeal process for employees, should they wish to pursue it further. According to a survey, 8 percent of U.K. workers had submitted a flexible working request to their employer within a week of the law being enacted, while another 11 percent have said they definitely plan to do so, perhaps in the near future. Roughly 35 percent of those surveyed said they might consider requesting flexible work hours at some point (Pilon 2014).51 Thus, the new law may prove to be a popular option for employees, but at the same time, employers will not be overrun with such requests, if only one in three employees are even considering making such a request. In Australia, similarly, the right to request was expanded (in 2009) from parents of preschool-aged children to any employee (with at least 12 months on a full-time or part-time experience with their employer) who has a child up to age 18 (or any caregiving responsibility for a member of his or her immediate family or household), has a disability, is experiencing domestic violence, or is age 55 or older. The age criterion may be regarded as providing a potential bridge or phasing of retirement. No dissatisfaction has been documented by either employees or employers, who must seriously consider a request for flexible working arrangements but may refuse on reasonable business grounds (see Skinner and Pocock 2011). Processes to improve the quality of part-time work include granting part-time workers pro-rata earnings and benefits, and rights to request changes in their working hours. It includes “reversibility”—to be able to move back from part-time to full-time hours after having moved from full-time to part-time. For example, France, Germany, the Netherlands, and Poland have such a right of “reversion to full-time” in their national laws for employees who have shifted hours within the same enterprise, whereas Australia and New Zealand leave such an option up to the negotiated agreement between the employee making the request and her employer. Not only the duration of working hours, but also work schedule predictability can be addressed through legislation. The widespread use of “zero-hours” contracts (which promise no minimum hours of employment) in the U.K. fostered a move on the part of the British government (termed, “BIS 2014-2”) in June 2014 to ban the use of exclusivity clauses in such contracts. President Obama has directed the federal Office of Personal Management (OPM) to initiate more flexible work and workplace options for the approximately 2 million federal employees. The directive includes a section with a “Right to Request Work Schedule Flexibilities.” Agencies must make federal employees aware, on a periodic basis, that they have the right to request work schedule flexibilities available to them under law, pursuant to an applicable collective bargaining agreement, or under agency policy, without fear of retaliation or adverse employment action as a consequence of making such a request. The agencies must facilitate conversations about work schedule flexibilities, including telework, part-time employment, or job sharing arrangements. Supervisors have to confer directly with the requesting employee as appropriate to understand fully the nature and need for the requested flexibility, and carefully respond within 20 business days of the initial request. In addition, other sections provide part-time and job sharing, telework, break times, and private spaces for nursing mothers. The directive goes on to promote “Encouraging Use of Work-Life Programs” generally plus providing help for agencies as to the “Use of Workplace Flexibilities and Work-Life Programs.” Finally, it directs the OPM to create, annually update, and publish a Workplace Flexibility Index using data from the Federal Employee Viewpoint Survey, reporting required by the Telework Enhancement Act of 2010, and other appropriate measures of agencies’ effective use of workplace flexibilities, reviewable periodically into the future, including issuing reports identifying any “best practices” and the removal of any barriers to or limitations uncovered that may unnecessarily restrict the use of existing workplace flexibilities and work-life programs (The White House 2014). In Congress, the Schedules that Work Act of 2014 (H.R. 5159), would extend this still further in scope. It would provide employees in all companies with 15 or more employees not only a right to request more flexible, predictable, or stable hours, but a “right to receive” schedule changes for those employees with caregiving or education responsibilities, unless the employer has bona fide business reasons for not doing so. This new right would target four key industries where irregular scheduling (and job growth) has been concentrated. It would require a minimum of 14 days advance notice for posting schedules. It also would mandate a minimum reporting payment for call-off and one hour’s pay for split-shifting practices. Specifically, the bill would require employers to inform workers in writing of their expected minimum hours and job schedule, on or before their first day of work. If the schedule and minimum hours happen to change, the employer would be required to notify the employee at least two weeks before the new schedule comes into effect. Employers would begin to have to compensate workers when they are sent home from work earlier than planned, paid at their regular rate for four hours or the total length of the workers’ shift if the shift is less than four hours. In addition, they would need to compensate workers at their usual rate for schedules changes, on-call shifts, and split shifts, when the employer changes the schedule less than 24 hours prior to a scheduled shift; when the worker is scheduled for an “on-call” or a “call-in” shift, but is not called in; and when the worker is scheduled for a shift interrupted by a non-working period (that is not a meal break) (Alexander and Haley-Lock 2013). The Schedules that Work Act and RAP and CPD campaigns have inspired further legislation proposed at the state level. For example, proposed legislation in Minnesota is the most far-reaching and promising among the states where legislation like San Francisco’s has been introduced (these states include Maryland, Massachusetts, and Connecticut). Each of the bills builds on and extends the provisions in the groundbreaking right to request law San Francisco enacted and is now enforcing. First, the Minnesota bill would apply to all employees (other than those covered by collective bargaining agreements), not just in the retail sector. Second, the amount of advance notice would be three weeks, not just two, for employers to post employees’ initial schedules, including on-call shifts, and employees must be notified of schedule changes at least 24 hours prior to the change. Third, employers must get consent from workers in order to add hours or shifts after the initial schedule is posted. Fourth, employees would receive one hour of predictability pay for all employer-initiated changes made to the schedule after it is posted, regardless of whether the advance notice is at least a week, with exceptions for emergency operations circumstances, but not for mandatory overtime or a coworker’s absence, as in San Francisco. Fifth, employees would be entitled to receive reporting pay of four hours or the duration of the shift, whichever is less, when their employer cancels or shortens a shift with less than 24 hours’ notice. Sixth, to protect against overwork, employers must secure employees’ consent to work with less than 11 hours rest between work shifts and employees must be compensated at a time-and-a-half pay rate if the employee agrees to work such hours. Seventh, the Minnesota bill has stronger protections regarding discrimination against workers on part-time hours, requiring employers to offer the same starting pay, access to time off, and promotion opportunities to part-time employees with skills and responsibilities comparable to those of full-timers. Eighth, the right to request scheduling accommodation allows employees to request a flexible working arrangement at any time, not just at the start of the employment relationship, and the employer must promptly evaluate and respond to the request, rather than just rejecting it. This right is targeted to those who arguably need or value it the most—it must be granted unequivocally if the request is due to a serious health condition, caregiving obligations, educational pursuits, or requirements of a second job. Ninth, employers must offer hours to existing (not just part-time) employees before hiring new staff or temporary workers. Finally, protection against retaliation is stronger, placing the burden on employers to show that an adverse action against an employee who exercised his or her rights or assisted others to assert their rights, was not retaliatory in nature. Enforcement would include an individual right to pursue civil penalties, in addition to actions by an office of labor standards. Some employers have undertaken fair scheduling initiatives on their own. While over 40 percent of the workforce receives notice of its work schedule less than a week in advance, Macy’s sets schedules for its employees as far as six months in advance for some of the shifts at its unionized stores in and around New York City. Some companies have instructed their local store managers to consider requests for making schedules more stable or consistent week to week, such as Starbucks (according to media accounts) and Ikea, which provides up to three weeks’ advance notice of upcoming schedules. Meanwhile other companies’ practices include not specifying a minimum for every employee, which allows some, such as working students, to request only 10 to 15 hours, even though other part-time workers might want a minimum of 20, or as in Costco, a minimum of 24 hours per week, posted at least one week in advance (Peck and Traub 2011). Such workers are also empowered to engage in the key practice of shift-swapping. Since much schedule instability found in hourly jobs (outside the more formal, “just-in-time” type of contingent jobs) typically comes in the form of overtime (Williams and Huang 2011), a “right to refuse” unwelcome, short-notice overtime work could be added to the rights to request. Other model practices include Cooperative Home Care Associates’ Minimum Hours Program. The home care staffing agency has a mix of longer-term, higher-hour cases and shorter-term, lower-hour cases. The company’s guaranteed hours program aims to provide workers with sufficient hours to make ends meet, while also allowing the company to cover its caseload with appropriate staff­ing. CHCA’s workers are guaranteed pay for 30 hours of work per week, even if 30 hours of work are not available (see CLASP, RAP, and Women Employed 2014). At Walmart, the Access to Open Hours initiative was a key demand of Making Change at Walmart, a campaign of the United Food and Commercial Workers union. After employee walkouts and protests over the past two years, spotlighting the company practice of limiting hours and opportunities for part-timers, Walmart agreed to curb such practices, and employees have reported marked improvements in their schedules and well-being generally (Jamieson 2014). Most recently, Dollar General has decided to increase the weekly hours of those employees whose weekly hours were reduced somewhat when their hourly wage rates were raised to compete with other, rival retailers’ increases (Ziobro 2015). Lonnie Golden is a professor of economics and labor-employment relations at Pennsylvania State University, Abington College. He holds a Ph.D. in economics from the University of Illinois-Urbana. His research has centered on the labor market and hours of work—specifically the economic and non-economic determinants of hours, including legal, organizational, and individual preferences, and their effects on well-being, including work-life and worker happiness, and on the level of employment. He is co-editor of the books, Working Time: International Trends, Theory and Policy Perspectives (Routledge Press) and Nonstandard Work: The Nature and Challenge of Changing Employment Arrangements (Cornell University Press), and author of research articles that have appeared in journals such as Industrial Relations and Monthly Labor Review. The author would like to thank Jaeseung Kim for his valuable research assistance, and Peter Fugiel, Julia Henly, Susan Lambert, and Jon Messenger for the PPP poll, NLSY and Scheduling Project data findings, and Ross Eisenbrey at EPI for guidance and support. 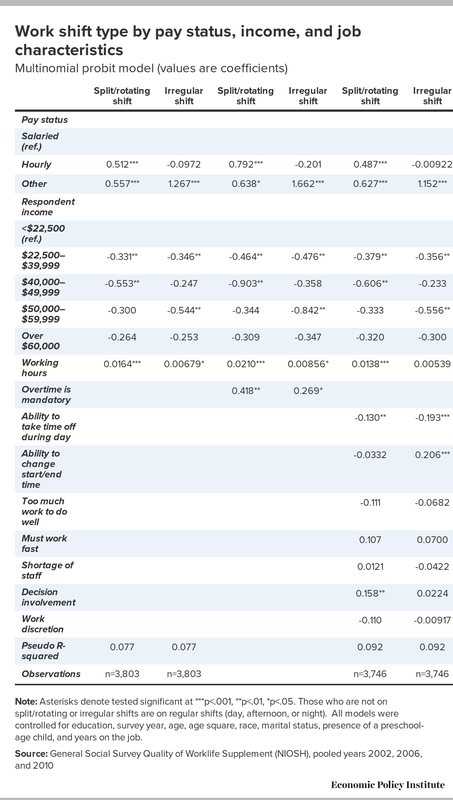 Note: The table shows responses to the question, "If you had the opportunity to work one more day each week and receive 20 percent more pay, would you take that opportunity?" Note: The table shows responses to the question, "If you had the opportunity to work one day less each week and receive 20 percent less pay, would you take that opportunity?" 1. The GSS survey could be underreporting “irregular” work shifts because it would not capture a worker who has an irregular work shift during the day and answers “day.” Furthermore, a recent poll suggests that working an “irregular” schedule as the hours one “usually works” could be as high as 16 percent (PPP, 2014). At least 24 percent of those employed are on the unstable, continuous shift time, when including the rotating and split shift workers, according to the PPP survey. 2. This measure combines “economic” reasons for working part-time (34 or fewer) hours (asked among those who indicate a preference for wanting and being available for full-time work): slack demand for work at their firm, poor business conditions, or an inability to find a “full-time” job (including work being only seasonal). Workers who answered thus are considered “involuntarily working part time” instead of full time.” “Non-economic” reasons include child care or other family/personal obligations, health/medical limitations, being in school/training, and being retired and/or having a Social Security limit on earnings (Canon, Kudlyak, and Reed 2014; Wilkins and Wooden 2011; Shaefer 2009). 3. Nevertheless, the labor market’s slow recovery largely reflects cyclical more than structural impediments (Rothstein 2012). 4. See Mayer 2014; Luce, Hammad, and Sipe 2014; and Haley-Lock and Ewert 2011. By occupation, the bulk of the remainder of such underemployment is found in the sales, administrative support, and transportation occupations. 5. Sum and Khatiwada 2010. The distribution of underemployment is highly concentrated also by worker’s income level. Half of it occurs among the lowest three of ten income deciles, constructed for the October–December period of 2009, whereas less than 8 percent of the incidence of underemployment occurred among the highest three income deciles. Indeed, for the bottom quintile, underemployment has not improved while it has for all others (Jolevski and Sherk 2014). 6. See Ben-Ishai, Matthews, and Levin-Epstein (2014), regarding the difficulties workers face trying to coordinate their daily or weekly work time with child care centers and also less formal provision arrangements. 7. See Ben-Ishai 2014; Sweet et al. 2014; Swanberg et al. 2011; Watson and Swanberg 2013; Golden 2012b; Bloom, Kretschmer, and Van Reenen 2011; Boushey and Glynn 2012; Lee and DeVoe 2012; Matos and Galinsky 2011; Lambert and Henly 2010; McGuire, Kenny, and Brashler 2010. 8. For descriptions by country, see Charlesworth and Campbell 2008; Heymann and Earle 2010; Hegewisch 2005. 9. Policy interventions have been recommended to increase sleep time by delaying the morning start time of work or making it more flexible, and offsetting inherent economic disincentives from working fewer hours (Basner, Spaeth, and Dinges 2014). Having an irregular sleep schedule can be just as hazardous for health as insufficient sleep (Locke 2014). 10. Many state and local laws already have been moving labor laws in the direction away from employee protections (Lafer 2013). 11. This may reflect an “added worker” effect. Because increases in the work hours of especially mothers, women are responsible for 11 percent of GDP growth since 1970 (Appelbaum, Boushey, and Schmitt 2014), and because women are overrepresented among those with fluctuating hours (Lambert 2008), this stagnation falls hardest on employed women. 12. Among men, 36 percent say it’s looked down upon at their company (versus 24 percent of men without children) to adjust to part-time work, even though most men feel that co-workers who work flexibly are at least as productive as those who do not (Lewis 2014). 13. Another 20 percent is “unsure,” neither preferring nor rejecting this tradeoff. 14. For the evidence of stagnating wages, see Gould 2014 and Rothstein 2012. 15. See Bernstein and Eisenbrey 2014; Shierholz 2013; and Golden 2014 for the particular cases of boosting earnings for millions of low-salaried and home health employees by updating current FLSA regulations. 16. Another 15 percent of those polled are “not sure,” neither preferring nor rejecting the tradeoff of more time for less income. 17. See Hacker et al. 2014. For example, children’s cognitive development, including older children’s test scores, have been inversely associated with parents working irregular, nontraditional work shift times (Boots 2004; Boushey and Mitukiewicz 2014; Li et al. 2014). For evidence that mismatches with one’s preferred hours (both too long or too short, but the former a bit more than the latter) adversely affect subjective well-being, see Wooden, Warren and Drago (2009). 18. The standard deviation of percent changes in household income rose about 30 percent between 1971 and 2008 (Dynan, Elmendorf, and Sichel 2012), with the share of households experiencing a 50 percent plus change in income over a two-year period rising from about 7 percent in the early 1970s to more than 12 percent in the early 2000s before retreating to 10 percent in the run-up to the Great Recession. 19. The apparent rise in volatility of earnings and hours is not accepted by all (see Jensen and Shore 2008). Recent research has documented a significant rise in the volatility (e.g., expected squared change) of individual incomes in the U.S. since the 1970s (Gottschalk et al. 1994). Existing measures of this trend abstract from individual heterogeneity, estimating an increase in average volatility. We decompose this increase in average volatility and find that it is far from representative of the experience of most people: There has been no systematic rise in volatility for the vast majority of individuals. The rise in average volatility has been driven almost entirely by a sharp rise in the income volatility of those expected to have the most volatile incomes, identified ex-ante by large income changes in the past. 20. Individuals were asked why their “income change[s] from month to month?” (Federal Reserve Board 2014). 21. This is derived from the International Social Survey Program Work Orientations III, 2005-06, for the US. 22. For the extent of employee control over their schedule in other countries, see Chung and Tijdens 2013; Fagan et al. 2012; Heymann and Earle 2010. 23. This percentage represents the proportion of employers who know about and use flexibility to some extent, not the proportion of employees that have access or make use of the options. A recent survey of working fathers by A Better Balance found that there is still somewhat of a flexibility stigma to requesting or using such flexibility, even if more available—nearly half would be at least “somewhat reluctant” to take advantage of flexible work schedules, even if they were offered/promoted by their employer (Bakst, Make, and Rankin 2011; also see Kelly and Kalev 2006). 24. Also diminishing were opportunities for employees to take career breaks for personal or family responsibilities. The importance of flexibility to employees is illustrated by a 2013 Catalyst study finding that even among workers without children living at home, 50 percent stated that flexible work arrangement are “very or extremely important” to them (Beninger and Carter 2013). 25. As is argued in Golden (2012a), to further broaden the comprehensive scope considered by Harris (2000). 26. Such “nonstandard” working hours are associated with receiving not only lower average pay—incidence almost twice as high among the very-low-wage employed—but being employed in the following industries, in sequential order: accommodation and food, arts and entertainment, retail, management and administrative service, transportation and warehousing, nondurable manufacturing, and heath/social assistance. It is also at least twice the overall average for security guards, waiters, laborers, nurses, stock clerks, and building cleaners. In contrast to variable schedules, nontraditional schedules are more common among women, particularly women (though not men) with preschool-aged children, but both variable and nontraditional schedules are more likely among those with less education. However, lower-income men are more likely than lower-income women to work outside standard hours (Enchautegui 2013). 27. See McCrate (2005) for the relationship between having variable workweeks and the ability to alter one’s own starting and ending times of work. 28. The perceived ability to take time off during work is a particularly powerful contributor to one’s overall well-being indicators—not only work-family balance, but happiness (see Golden, Henly, and Lambert 2013). 29. This ability to influence start and stop times goes beyond that afforded to workers who work longer hours (see Golden 2009), because hours are controlled for. Note that three working condition controls were associated with more split and rotating shift working—the feeling that work must be at a fast pace, that there is a shortage of staff, and not being involved in decisions. 30. See Golden, Wiens-Tuers, Lambert, and Henly 2011; Enchautegui 2013. 31. Irregular and on-call shift working is arguably a result of an employer strategy of lean staffing of shifts hour-to-hour, while keeping a buffer of employees on the rolls to schedule hours on short notice (see Lambert, 2008). 32. The full sample includes 4,534 workers. A worker is less likely to have mandatory overtime work if she is female or possesses a college degree. They are no more likely to have overtime if they have children. By year, there was a slight increase in such work in 2010 than in prior years, but not a significant difference when accounting for income and work hours. 33. No effect or influence was found when also controlling for the extent to which employees perceive that they are involved in decisions that affect them in the workplace as well as when controlling for having freedom to decide how to do their jobs. 34. These are precisely the workers that the Obama administration is considering having their overtime covered (Golden 2014; Bernstein and Eisenbrey 2014; Lambert, Haley-Lock, and Henly 2012. 35. Most pertinent, however, was that the perception that there are “too few workers” did not significantly intensify the incidence of working on irregular schedules; it was associated with more working mandatory overtime. 36. Probit estimations were conducted and yielded results very similar to OLS (ordinary least squares) estimates. 37. OLS regressions yielded virtually identical findings. Worker fatigue as a dependent variable was also estimated, with results less striking for shift timing—results are available upon request from the author. 38. For workers whose employment relationship is neither salaried nor hourly with the employer, irregular work schedules are not significantly adversely affecting work-family interference. 39. Greater income appears to be associated with more frequency of work-family conflict, suggesting more money does not relieve such conflict and/or that part-time or part-year employment may prevent or avoid such work-family conflict. Greater income, however, with small exceptions, is not positively associated with greater work stress. 41. There was little effect found per year, except slightly higher work-family conflict in 2010 than in earlier sample periods (and slightly higher work stress in 2006 among salaried workers only). 42. The results were virtually identical when the measure of mandatory overtime work included only those whose overtime work is required and they worked overtime at least one day in the last month. This suggests that it is the general working condition that extra work may be required at any given time that is associated with conflict and stress, more than the actual working of that overtime. 43. It is possible that there is some reverse causality contributing to this inverse association—that workers with the most work-family conflict are less apt to be required to work overtime, either by their employers or by their self-selection of jobs or working condition. 44. In addition, the results show that hourly workers do not have significantly relatively lower work-family conflict vis-à-vis salaried workers generally, but that this reduction is attributable to the nature of their work shift schedule. Similarly, workers on types of employment contracts other than regular day shifts actually have relatively higher work-family conflict than salaried workers, but this is entirely attributable to the timing of their work shift. 45. A third indicator supports the findings of the other two. All individuals in the ISSP module are asked, “Suppose you could change the way you spend your time. … Which would you like to spend more time on, which would you like to spend less time on … now? The response for “time in paid work” is used as a third indicator of underemployment and “less time in paid work” is used as an indicator of overemployment. 46. 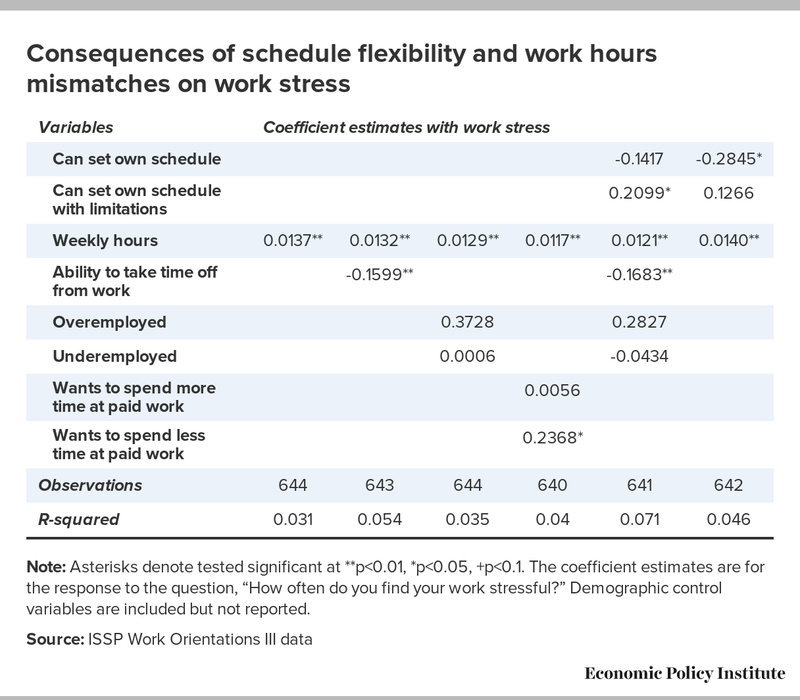 Although not shown in the table, another indicator of work schedule flexibility, being able to take time off during work (identical to the QWL question), also reduces work-family conflict (coefficient is -0.2922**). 47. Although not shown in the table, control variables include age and age-squared; whether male, white, or married; and number of children. Job interference with family is highest among those with two children, among whites and men. 48. Elsewhere, there are useful compilations and descriptions of other countries’ attempts to provide more individual access to control over one’s own work hours or schedules and legal protection to requesting it (Andresen 2015; Berg, Bosch, and Charest 2014; Kassinis and Stavrou 2013; Boushey 2011; Hegewisch and Gornick 2008; Hegewisch 2009; Boulin et al. 2006; Hegewisch 2005; Labor Project for Working Family 2014). 49. Over 80 percent of such requests, after the program was begun, were approved (Hegewisch 2005). 50. The effort was spearheaded by a coalition built by Jobs with Justice San Francisco (Williams 2015). 51. The survey was conducted by a conference calling service, PowWowNow. Its director was shocked mainly by the finding that 46 percent of respondents were unaware of the previous law. 52. Introduced on June 27, 2013, by Rep. Carolyn Maloney (D-N.Y.) and Sen. Bob Casey (D-Pa.). The Secretary of Labor would receive, investigate, and attempt to resolve complaints of violations, of section 6 and 7 of the Fair Labor Standards Act of 1938. 53. If the employee is dissatisfied with the employer’s rejection or alternative, the employee would have the right to receive the decision in writing and then schedule meetings, accompanied by a representative, and if necessary, hearings in a federal court. Aarons-Mele, Morra. 2014. “Unpredictable Work Hours Are Stressing too Many People Out.” Harvard Business Review, August 27. Alexander, Charlotte, and Anna Haley-Lock. 2013. “Not Enough Hours in the Day: Work Hour Insecurity and a New Approach to Wage and Hour Regulation.” Georgia State University College of Law Legal Studies Research Paper. Alexander, Charlotte, Anna Haley-Lock, and N. Ruan. 2014. “Stabilizing Low-wage Work: Legal Remedies for Unpredictable Work Hours and Income Instability.” Harvard Civil Rights-Civil Liberties Law Review (CR-CL), U Denver Legal Studies Research Paper No. 13-43. Andresen, Maike. 2015. “A Look Into the Future: Is Working Time Freedom Apt to Add Value for Different Stakeholders?” Human Resource Management Practices, pp. 107–124. Springer International. Appelbaum, Eileen, Heather Boushey, and John Schmitt. 2014. The Economic Importance of Women’s Rising Hours of Work. Center for American Progress and the Center for Economic and Policy Research. Askenazy, Philippe. 2004. “Shorter Work Time, Hours Flexibility and Labor Intensification.” Eastern Economic Journal, vol. 30, no. 4, 603–14. Bakst, Dina, Jared Make, and Nancy Rankin. 2011. Beyond The Breadwinner: Professional Dads Speak Out on Work and Family. A Better Balance. Ballotpedia. 2013. “City of SeaTac ‘Good Jobs Initiative’ Minimum Wage Increase, Proposition 1.” November. Basner, M., A.M. Spaeth, and D.F. Dinges. 2014. “Sociodemographic Characteristics and Waking Activities and Their Role in the Timing and Duration of Sleep.” Sleep, vol. 37, no.12, 1889–1906. Beninger, Anna, and Nancy M. Carter. 2013. The Great Debate: Flexibility vs. Face Time—Busting the Myths Behind Flexible Work Arrangements. Catalyst. Ben-Ishai, Liz. 2014. Job Schedules that Work for Businesses, Center for Law and Social Policy CLASP. Ben-Ishai, Liz, and Hannah Matthews. 2014. Federal Legislation to Improve Job Schedules and Child Care Access for Low-Wage Workers, November 19. Ben-Ishai, Liz, Hannah Matthews, and Jodie Levin-Epstein. 2014. Scrambling for Stability: The Challenges of Job Schedule Volatility and Child Care. Center for Law and Social Policy (CLASP). Berg, Peter, Gerhard Bosch, and Jean Charest. 2014. “Working-Time Configurations: A Framework for Analyzing Diversity across Countries.” Industrial and Labor Relations Review, vol. 67, no. 3, 805–837. Bernstein, Jared, and Ross Eisenbrey. 2014. New Inflation-adjusted Salary Test Would Bring Needed Clarity to FLSA Overtime Rules. Economic Policy Institute report. Bloom N., T. Kretschmer, and J. Van Reenen. 2011. “Are Family-Friendly Workplace Practices a Valuable Firm Resource?” Strategic Management Journal, vol. 32, 343–367. Bohle, Philip, Harold Willaby, Michael Quinlan, and Maria McNamara. 2011. “Flexible Work in Call Centres: Working Hours, Work-life Conflict & Health.” Applied Ergonomics, vol. 42, no. 2, 219–224. Boots, Shelley Waters. 2004. The Way We Work: How Children and Their Families Fare in a 21st Century Workplace, The New America Foundation. Boushey, Heather. 2011. “The Role of the Government in Work-Family Conflict.” The Future of Children, vol. 21, no. 2, 163–190. Boushey Heather, and Alexandra Mitukiewicz. 2014. Job Quality Matters: How Our Future Economic Competitiveness Hinges on the Quality of Parents’ Jobs. Washington Center for Equitable Growth. Boushey, Heather, and Sarah Jane Glynn. 2012. There Are Significant Business Costs to Replacing Employees. Center for American Progress. Camerino, Donatella, Marco Sandri, Samantha Sartori, Paul Maurice Conway, Paolo Campanini, and Giovanni Costa. 2010. “Shiftwork, Work-Family Conflict among Italian Nurses, and Prevention Efficacy.” Chronobiology International, vol. 27, no. 5, 1105-1123. Canadian Labour Congress. 2011. Mapping Basic Working Conditions in Employment Standards Laws across Canada — 2011/2012. October. Canon, Maria E., Marianna Kudlyak, and Marisa Reed. 2014. “Is Involuntary Part-time Employment Different after the Great Recession?” The Regional Economist. Federal Reserve Bank of St. Louis, July. Carré, Françoise, and Chris Tilly. 2012. “Work Hours in Retail: Room for Improvement.” Policy Paper No. 2012-012. Kalamazoo, Mich.:W.E. Upjohn Institute for Employment Research. Cauthen, Nancy K. 2011. “Scheduling Hourly Workers: How Last Minute.” Just-In-Time Scheduling Practices Are Bad for Workers, Families and Business.” Demos. New York, March. Center for Law and Social Policy (CLASP). 2014. Job Schedules that Work for Businesses. November 26. Center for Law and Social Policy (CLASP), Retail Action Project (RAP), and Women Employed. 2014. Tackling Unstable and Unpredictable Work Schedules. Charlesworth, Sara, and Iain Campbell. 2008. “Right to Request Regulation: A Panacea for Work/Family Imbalance?” Draft, Parliament of Australia. Chung, H., and K. Tijdens. 2013. “Working Time Components and Working Time Regimes in Europe: Using Company-level Data Across 21 Countries.” International Journal of Human Resource Management, vol. 24, no. 7, 1418–1434. Correll, S. J., E.L. Kelly, L. Trimble-O’Connor, and J. Williams, J. 2014. “Redesigning, Redefining Work.” Work & Occupations, vol. 41, no. 1, 3–17. Costa, Giovanni, Samantha Sartori, and Torbjorn Akerstedt. 2006. “Influence of Flexibility and Variability of Working Hours on Health and Well-being.” Chronobiology International, vol. 23, no. 6, 1125–37. Covert, Bryce. “How Unpredictable Hours Are Screwing Up People’s Lives.” 2014. ThinkProgress (Center for American Progress blog), September 11. Crain, Marion, and Michael Sherraden (eds. ), Working and Living in the Shadow of Economic Fragility. Oxford University Press, 120. Dahl, Molly, Thomas DeLeire, and Jonathan Schwabish. 2011. “Estimates of Year-to-Year Volatility in Earnings and in Household Incomes from Administrative, Survey and Matched Data.” Journal of Human Resources, Fall, vol. 46, 750–774. Delaney, Arthur, and Emily Swanson. 2014. “Less Pay, More Weekend? Some Americans Are Ready To Say Yes.” Huffington Post, July 26. Demos, 2013. Underwriting Bad Jobs: How Our Tax Dollars Are Funding Low-Wage Work and Fueling Inequality, May. Dynan, Karen, Douglas Elmendorf, and Daniel Sichel. 2012. “The Evolution of Household Income Volatility.” The B.E. Journal of Economic Analysis & Policy: Vol. 12: Iss. 2 (Advances), Article 3. Enchautegui, María E. 2013. Nonstandard Work Schedules and the Well-Being of Low-Income Families, Urban Institute, Paper 26, July. Fagan, Colette, Clare Lyonette, Mark Smith, and Abril Saldaña-Tejeda. 2012. The Influence of Working Time Arrangements on Work-life Integration or ‘Balance’: a Review of the International Evidence. International Labour Organization. Federal Reserve Bank Board of Governors. 2014. Report on the Economic Well-Being of U.S. Households in 2013. Glauber, Rebecca. 2013. Wanting More but Working Less: Involuntary Part-time Employment and Economic Vulnerability. The Carsey School of Public Policy at the University of New Hampshire Scholars’ Repository. Golden, Lonnie. 2009. “Flexible Daily Work Schedules in US Jobs: Formal Introductions Needed?” Industrial Relations, vol. 48, no. 1, 27–54. Golden, Lonnie. 2012a. “Becoming too Small to Bail – Prospects for Workers in the 2011 Economy and 112th Congress.” Indiana Labor Law Journal. Golden, Lonnie. 2012b. The Effects of Working Time on Productivity and Firm Performance: A Research Synthesis Paper. International Labour Organization. Golden, Lonnie. 2014. Flexibility and Overtime Among Hourly and Salaried Workers: When You Have Little Flexibility, You Have Little To Lose. Economic Policy Institute Briefing Paper #385. Golden, L., J. Henly, S. Lambert, and J. Kim. 2013. “Work Schedule Flexibility for Workers: A Path to Employee Happiness?” Journal of Social Research and Policy, vol. 4, no.2, December, 107–135. Golden, L., and Adam Okulicz-Kozaryn. 2015. Work Hours and Worker Happiness in the US: Weekly Hours, Hours Preferences and Schedule Flexibility. Draft. Golden, Lonnie, Barbara Wiens-Tuers, Susan J. Lambert, and Julia R. Henly. 2011. “Working Time in the Employment Relationship: Working Time, Perceived Control and Work–life Balance.” Chapter 10, in Research Handbook on the Future of Work and Employment Relations. Eds. K. Townsend and A. Wilkinson Cheltenham, U.K.: Edward Elgar, 188–211. González, Ángel. 2014. “Starbucks Vows to Change Unpredictable Barista Work Schedules.” Seattle Times, August 14. Gottschalk, Peter, and Robert Moffitt. 2009. “The Rising Instability of U.S. Earnings.” The Journal of Economic Perspectives, vol. 23, no. 4, Fall, 3–24. Gottschalk, Peter, Robert Moffitt, Lawrence F. Katz, and William T. Dickens. 1994. “The Growth of Earnings Instability in the U.S. Labor Market.” Brookings Papers on Economic Activity, 217–272. Gould, Elise. 2015. 2014 Continues a 35-Year Trend of Broad-Based Wage Stagnation, Economic Policy Institute Issue Brief #393. Hacker, Jacob S., Gregory A. Huber, Austin Nichols, Philipp Rehm, Mark Schlesinger, Rob Valletta, and Stuart Craig. 2014. “The Economic Security Index: A New Measure for Research and Policy Analysis.” Review of Income and Wealth, vol. 60, Issue Supplement S1, pages S5–S32. Haley-Lock, Anna, and Stephanie Ewert. 2011. “Waiting for the Minimum: U.S. State Wage Laws, Firm Strategy, and Chain-Restaurant Job Quality,” Journal of Industrial Relations, vol. 53, no. 1, 31–48. Harris, Seth D. 2000. “Conceptions of Fairness and The Fair Labor Standards Act,” Hofstra Labor & Employment Law Journal, vol. 18, 19. Hegewisch, Ariane. 2005. Employers and European Flexible Working Rights: When the Floodgates Were Opened. UC Hastings College Center for Worklife Law, Issue Brief, Fall. Hegewisch, Ariane. 2009. Flexible Working Policies: A Comparative Review, Institute for Women’s Policy Research and the Equality and Human Rights Commission. Hegewisch, Ariane, and Gornick, Janet. 2008. Statutory Routes to Workplace Flexibility in Cross-National Perspective. Institute for Women’s Policy Research and the Center For Worklife Law, University Of California Hastings College of the Law. Heisz, Andrew, and Sébastien LaRochelle-Côté. 2006. “Work Hours Instability.” Perspectives on Labour and Income, vol. 7, no. 12, 17–20. Henly, J. R., H.L. Shaefer, and E. Waxman. 2006. “Nonstandard Work Schedules: Employer- and Employee-Driven Flexibility in Retail Jobs.” Social Service Review, vol. 80, no.4, 609–34. Heymann, Jody, and Alison Earle. 2010. Raising the Global Floor: Dismantling the Myth that We Can’t Afford Good Working Conditions for Everyone. Stanford, Calif.: Stanford University Press. Jacobs, Anna W., and Irene Padavic. 2015. “Hours, Scheduling and Flexibility for Women in the US Low‐Wage Labour Force.” Gender, Work & Organization, vol. 22, issue 1, 1418–1434. Jamieson, Dave. 2014. “In Wake of Protests, Walmart Workers Find More Hours within Reach.” Huffington Post, April 7. Jensen, Shane T., and Stephen H. Shore. 2008.”Changes in the Distribution of Income Volatility.” Johns Hopkins University, mimeo. arXiv preprint arXiv:0808.1090. Jolevski, Filip, and James Sherk. 2014. Shrinking Workweeks: A Sign of Unequal Recovery from the Great Recession. Heritage Foundation, Backgrounder #2921 on Labor. Kalleberg, A.L. 2011. Good Jobs, Bad Jobs: The Rise of Polarized and Precarious Employment in the United States, 1970s to 2000s. New York: Russell Sage Foundation. Kantor, Jodi. 2014. “As Shifts Vary, Family’s only Constant Is Chaos.” New York Times, August 14. Kassinis, G. I., and E.T. Stavrou. 2013. “Non-standard Work Arrangements and National Context.” European Management Journal, vol. 31, no .5, 464–477. Kelly, Erin L., Phyllis Moen, J. Michael Oakes, Wen Fan, Cassandra Okechukwu, Kelly D. Davis, Leslie B. Hammer. 2014. “Changing Work and Work-Family Conflict Evidence from the Work, Family, and Health Network.” American Sociological Review, June, vol. 79, no. 3, 485–516. Kelly, Erin L., and Alexandra Kalev. 2006. “Managing Flexible Work Arrangements in U.S. Organizations: Formalized Discretion or ‘a Right to Ask.’” Socio-Economic Review, vol. 4, no. 3, 379–416. Kroll, Steven. 2011. “The Decline in Work Hours During the 2007–09 Recession,” Monthly Labor Review, April, 53–59. Kulow, Marianne DelPo. 2012. “Legislating a Family-Friendly Workplace: Should It Be Done in the United States?” Northwestern Journal of Law and Social Policy, vol. 7. Lafer, Gordon. 2013. The Legislative Attack on American Wages and Labor Standards, 2011–2012. Economic Policy Institute, Briefing Paper # 364, October 31. Lambert, Susan J. 2008. “Passing the Buck: Labor Flexibility Practices that Transfer Risk onto Hourly Workers.” Human Relations, vol. 61, no. 9, 1203–27. Lambert, Susan J., Peter J. Fugiel, and Julia R. Henly. 2014. Schedule Unpredictability among Early Career Workers in the U.S. Labor Market: A National Snapshot. EINet (Employment Instability, Family Well-being, and Social Policy Network) at the University of Chicago. Lambert, Susan J., Anna Haley-Lock, and Julia R. Henly. 2012. “Schedule Flexibility in Hourly Jobs: Unanticipated Consequences and Promising Directions.” Community, Work & Family, vol. 15, no. 3, 293–315. Lambert, Susan, Anna Haley-Lock, and Julia R. Henly. 2012. “Labour Flexibility and Precarious Employment in Hourly Retail Jobs in the U.S: How Frontline Managers Matter.” In Are Bad Jobs Inevitable? Trends, Determinants and Responses to Job Quality in the Twenty-First Century. Ed. Chris Warhurst et al. London: Palgrave Macmillan. Lambert, Susan, and Julia Henly. 2010. Work Scheduling Study: Mangers’ Strategies for Balancing Business Requirements with Employee Needs, Manager Survey Results, University of Chicago School of Social Service Administration. Lewis, Katherine Reynolds. 2014. How Men Flex: The Working Mother Report, Working Mother, October 21. Li, Jianghong, Sarah E. Johnson, Wen-Jui Han, Sonia Andrews, Garth Kendall, Lyndall Strazdins, and Alfred Dockery. 2014. “Parents’ Nonstandard Work Schedules and Child Well-Being: A Critical Review of the Literature.” The Journal of Primary Prevention, vol. 35, no. 1, 53–73. Locke, Susannah. 2014. “Why the Workday Should Be 10–6, Not 9–5,” VOX, December 23. Luce, Stephanie, Sasha Hammad, and Darrah Sipe. 2014. Short-Shifted. Retail Action Project, The Murphy Institute for Worker Education and Labor Studies at the City University of New York, and the Retail, Wholesale and Department Store Union. Lyness, K. S., J.C. Gornick, P. Stone, and A.R. Grotto. 2012. “It’s All about Control: Worker Control over Schedule and Hours in Cross-National Context.” American Sociological Review, vol. 77, no. 6, 1023–1049. Martin, James E., Robert R. Sinclair, Ariel M. Lelchook, Jenell L. S. Wittmer, and Kristen E. Charles. 2012. “Nonstandard Work Schedules and Retention in the Entry-Level Hourly Workforce.” Journal of Occupational and Organizational Psychology, vol. 85, 1–22. Matos, Kenneth, and Ellen Galinsky. 2011. Workplace Flexibility in the United States: A Status Report. Families and Work Institute. Matos, Kenneth, and Ellen Galinsky. 2014. National Study of Employers. Families and Work Institute and Society for Human Resources Management. Mayer, Gerald. 2014. “The Increased Supply of Underutilized Labor from 2006 to 2014.” Monthly Labor Review, November. McCrate, Elaine. 2005. “Flexible Hours, Workplace Authority, and Compensating Wage Differentials in the U.S.” Feminist Economics, vol. 11, no. 1, 11–39. McCrate, E. 2012. “Flexibility for Whom? Control over Work Schedule Variability in the U.S.” Feminist Economics, vol. 18, no.1, 39–72. McNamara, Maria, Philip Bohle, and Michael Quinlan. 2011. “Precarious Employment, Working Hours, Work-Life Conflict and Health in Hotel Work.” Applied Ergonomics, vol. 42, no. 2, 225–232. Messenger, Jon (senior research officer with the Conditions of Work and Employment Programme of the International Labour Organization). 2015. Information regarding Loi sur la sécurisation de l’emploi provided personally to the author. National Institute for Occupational Safety and Health (NIOSH). 2002, 2006, 2010. General Social Survey Quality of Worklife Supplement. Olsen, Karen M., and Svenn-Åge Dahl. 2010. “Working Time: Implications for Sickness Absence and the Work–Family Balance.” International Journal of Social Welfare, vol. 19, no.1, 45–53. Peck, Ben, and Traub, Amy. 2011. Worth Working For: Strategies for Turning Bad Jobs into Quality Employment. October 11. Pilon Annie. 2014. “Survey: 11 Percent of UK Workers Want Flexible Hours In Employment.” October 27. Powell, Lane C. 2013. Flexible Scheduling and Gender Equality: The Working Families Flexibility Act under the Fourteenth Amendment. Prause, JoAnn, David Dooley, and Jimi Huh. 2009. “Income Volatility and Psychological Depression.” American Journal of Community Psychology vol. 43, nos. 1-2, 57–70. Public Policy Polling (PPP). 2014, December 9-11. National Survey Results, for the Employment Insecurity Network, University of Chicago. Rothstein. Jesse. 2012. “The Labor Market Four Years into the Crisis: Assessing Structural Explanations.” Industrial and Labor Relations Review, July, vol. 65, no. 3, 467–500. Ruan, Nantiya, and Nancy Reichman. 2014. “Hours Equity Is the New Pay Equity.” Villanova Law Review, vol. 59: 35. Shierholz, Heidi. 2013. Low Wages and Scant Benefits Leave Many In-Home Workers Unable to Make Ends Meet. EPI Briefing Paper #369, Economic Policy Institute, November 25. Scott, Ellen K., Kathryn Edin, Andrew S. London, and Rebecca Joyce Kissane. 2004. “Unstable Work, Unstable Income: Implications for Family Well-Being in the Era of Time-Limited Welfare.” Journal of Poverty, vol. 8, no. 1, 61-88. Shaefer, H. Luke. 2009. “Part-Time Workers: Some Key Differences between Primary and Secondary Earners.” Monthly Labor Review, vol. 3, 3–15. Shin, Donggyun. 2012. “Recent Trends in Men’s Earnings Volatility: Evidence from the National Longitudinal Survey of Youth, 1985-2009.” The B.E. Journal of Economic Analysis & Policy: Vol. 12: Iss. 2 (Topics), Article 2. DOI: 10.1515/1935-1682.3339. Shin, D., and G. Solon. 2011. “Trends in Men’s Earnings Volatility: What Does the Panel Study of Income Dynamics Show?” Journal of Public Economics, vol. 95, no. 7, 973–982. Skinner, N., and B. Pocock. 2011.” Flexibility and Work-life Interference in Australia.” Journal of Industrial Relations, vol. 53, no. 1, 65–82. Starosciak, 2013. Michael. “State-by-State Reporting Time Pay Laws.” Wage and Hour Review. Posted on February 5. Stringer, Scott M. Families and Flexibility: Reshaping the Workplace for the 21st Century. Comptroller’s Office. New York City, June 2014. Sum, Andrew, and Ishwar Khatiwada. 2010. “The Nation’s Underemployed in the ‘Great Recession’ of 2007–09,” Monthly Labor Review, November, 3–15. Swanberg, Jennifer E., Sharon P. McKechnie, Mamta U. Ojha, and Jacquelyn B. James. 2011. “Schedule Control, Supervisor Support and Work Engagement: A Winning Combination for Workers in Hourly Jobs?” Journal of Vocational Behavior, vol. 79, no. 3, 613-624. Swanberg, J. E., E. Watson, and M. Eastman, M. 2014. “Scheduling Challenges among Workers in Low-Wage Hourly Jobs: Similarities and Differences among Workers in Standard- and Nonstandard-hour Jobs.” Community, Work & Family, vol. 17, no. 4, 409–435. Sweet, S., E. Besen, M. Pitt-Catsouphes, and T.K. McNamara. 2014. “Do Options for Job Flexibility Diminish in Times of Economic Uncertainty?” Work, Employment & Society, vol. 28, no. 6, 882–903. Sweet, Stephen, Marcie Pitt-Catsouphes, Elyssa Besen, and Lonnie Golden. 2014. “Explaining Organizational Variation in Flexible Work Arrangements: Why the Pattern and Scale of Availability Matter.” Community, Work & Family, vol. 17, no. 2, 115–141. Tucker, Philip, and Simon Folkard. 2012. Working Time, Health and Safety: a Research Synthesis Paper. International Labour Organization. U.S. Bureau of Labor Statistics (U.S. BLS). 2015a. “Employment Level—Part-Time for Economic Reasons, All Industries” [Labor Force Statistics from the Current Population Survey database]. U.S. Bureau of Labor Statistics (U.S. BLS). 2015b. “Table A-8. Employed Persons by Class of Worker and Party-Time Status.” (Economic News Release). March 6. Wang, Wendy. 2013. “Mothers and Work: What’s ’Ideal’?” Fact Tank – Our Lives in Numbers (Pew Research Center), August 19. Watson, Liz, and Jennifer E. Swanberg. 2013. “Flexible Workplace Solutions for Low-Wage Hourly Workers: A Framework for a National Conversation 1.” American University. Labor & Employment. LF, vol. 3, 380–522. The White House. 2014. “Presidential Memorandum—Enhancing Workplace Flexibilities and Work-Life Program.” June 23. Wilkins, Roger, and Mark Wooden. 2011. ‘Economic Approaches to Studying Underemployment.” Chapter 2, in Underemployment: Psychological, Economic, and Social Challenges. Ed. D. Feldman and D. Maynard. New York: Springer. Williams, Joan, and Heather Boushey. 2010. The Three Faces of Work-Family Conflict. Center for American Progress. Williams, Joan C., and Penelope Huang. 2011. “Improving Work-Life Fit in Hourly Jobs: An Underutilized Cost-Cutting Strategy in a Globalized World.” Available at SSRN 2126291. Williams, Jonathan. 2015. “Groundbreaking Labor Rights Coming Your Way.” Jobs with Justice SF, February 3. Wood, Stephen, George Michaelides, and Peter Totterdell. 2013. “The Impact of Fluctuating Workloads on Well-being and the Mediating Role of Work−Nonwork Interference in This Relationship.” Journal of Occupational Health Psychology, vol. 18, no. 1, 106. Wooden, M., D. Warren, and R. Drago. 2009. “Working Time Mismatch and Well-being.” British Journal of Industrial Relations, vol. 47, 147–179. Yildirim, Dilek, and Zeynep Aycan. 2008. “Nurses’ Work Demands and Work-Family Conflict: A Questionnaire Survey.” International Journal of Nursing Studies, vol. 45, no. 9, 1366–1378. Zeytinoglu, I., W. Lillevik, M. Seaton, J. Moruz. 2004. “Part-Time and Casual Work in Retail Trade: Stress and Other Factors Affecting the Workplace,” Relations Industrielles, vol. 59, no. 3, 516–542. Ziliak, James, Bradley Hardy, and Christopher Bollinger. 2011. “Earnings Volatility in America: Evidence from Matched CPS.” Labour Economics, December, vol. 18, 742–754. Ziobro, Paul. 2015. “Dollar General Plans to Spend More on Labor This Year” Wall St. Journal, March 12.